Here’s a chocolate covered Oreos recipe perfect for summer gatherings. 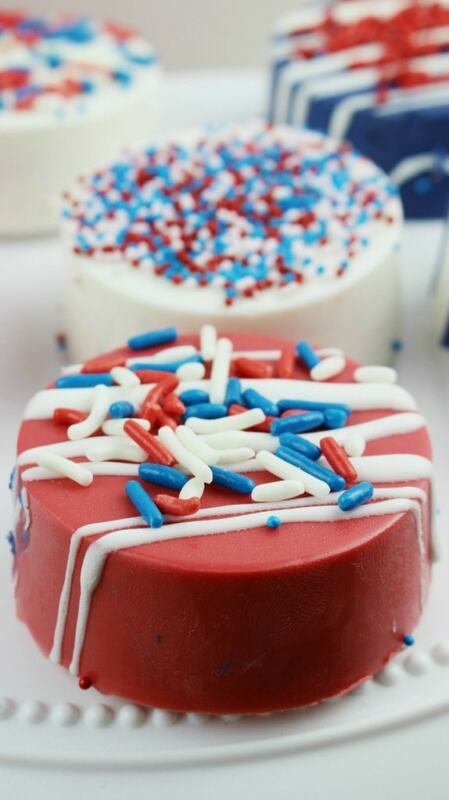 The festive red, white, and blue is ideal for Memorial Day or 4th of July parties, but works for all year, too. Chocolate covered Oreos are quite easy to make, but pretty enough to impress your guests. 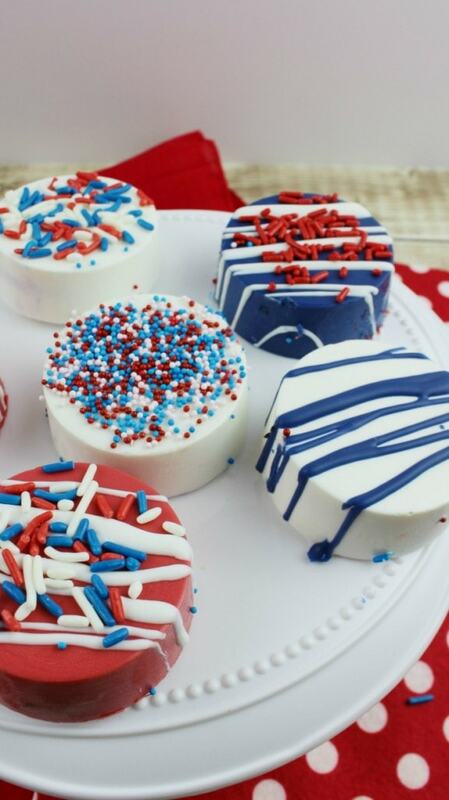 Get ready for fireworks in your mouth when you taste these babies. It’s like a chocolate explosion when you combine Oreos with extra sweets. Definitely a drool-worthy dessert to serve or bring to any celebration. In a double boiler pan, melt 1 tablespoon solid shortening. Add white chocolate melts to the shortening and stir until completely melted. Pour 2 T of the melted chocolate into each mold to cover the bottom entirely. Place an Oreo into each mold, on top of the melted chocolate. Using a Tablespoon, pour additional melted chocolate on top of the Oreo until the mold is full. Set aside remaining melted chocolate for later. Remove candy molds from refrigerator after one hour. Gently press down on the molds to lift the cookies out onto the baking sheet. Reheat any remaining melted chocolate (most likely it has hardened) in the microwave for 30 seconds. Using a spoon, drizzle the chocolate over the Oreos in a different color. Red over a blue or white Oreo and white over a red or blue Oreo, etc. Sprinkle each cookie with your choice of sprinkles, nonpareils, and jimmies. Red, white, and blue colors are super festive for the 4th of July or Memorial Day. It’s easy to change the colors for whatever your party theme is. Experiment and have fun with them. Let the kids decorate them and get creative. 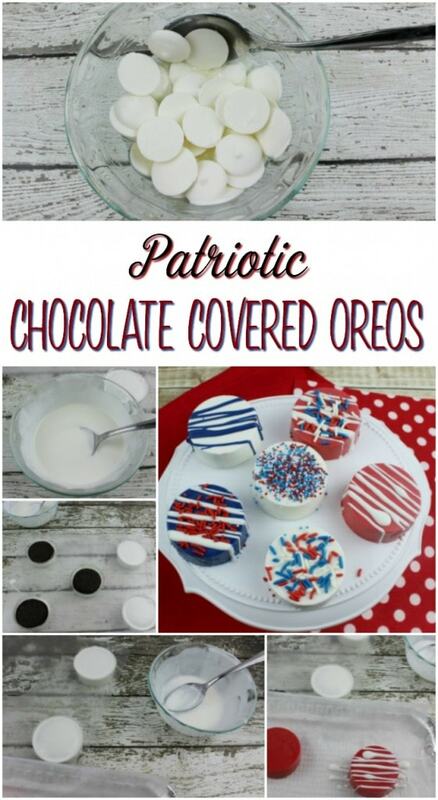 This chocolate covered Oreos recipe is good no matter which colors you choose! Have you tried a chocolate covered Oreos recipe yet? Those would be so very festive at parties. I love these Oreos. 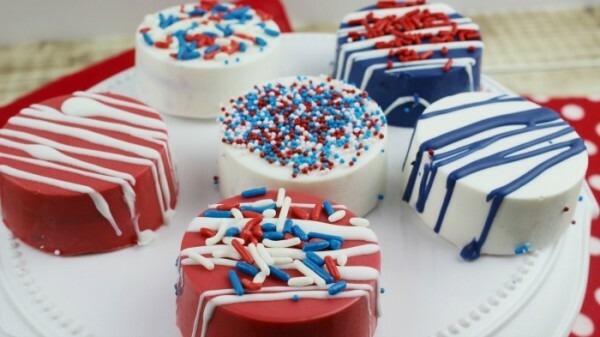 They are really festive and pretty and wonderful for a 4th of July Party. I shared this on Pinterest. 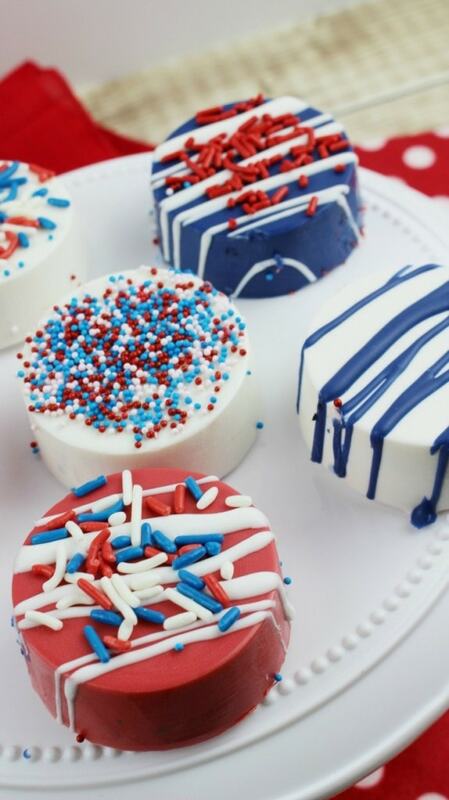 I have never tried chocolate covered Oreos but these look sooooo good! 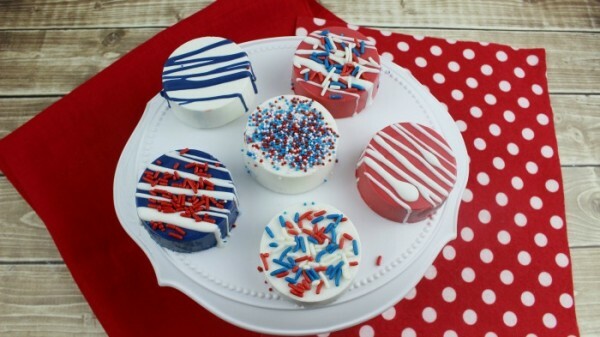 What cute designs and a great way to celebrate the 4th or Memorial Day. Definitely pinned these for future reference! Oh my goodness, so cute! Not to mention, YUM! Thanks for linking up with Delicious Dishes Recipe Link Party! This will be fun for me and my granddaughter to do for our little 4th of July get together. Yummy! Thanks for sharing. These not only look festive they look awesome and delicious! I wish I had this recipe for my 4th of July party, which also happens to be my birthday. Thank you for sharing. Definitely pinning for later.